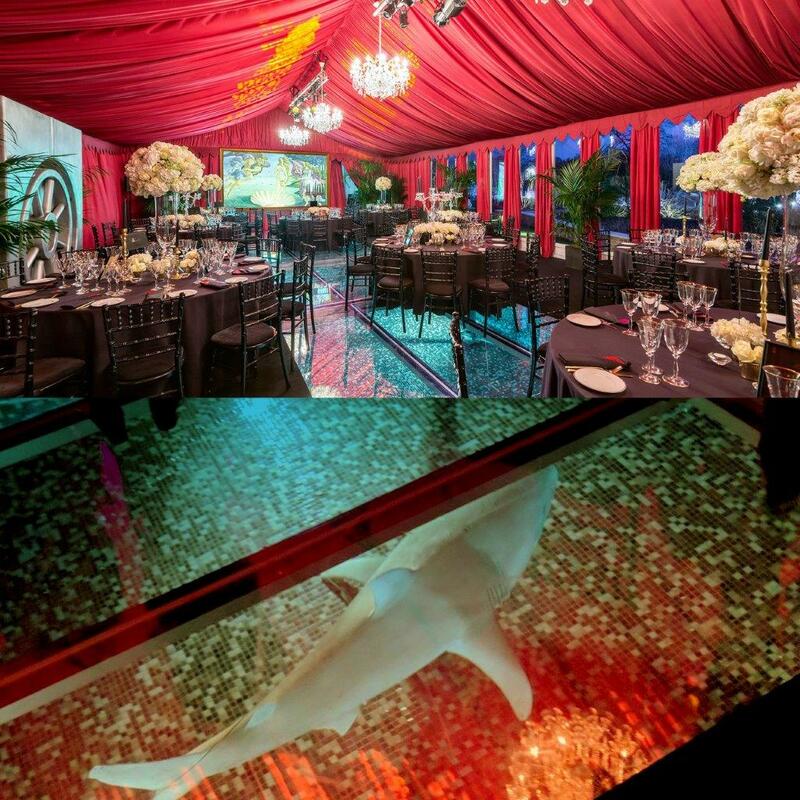 Our brief for this private party was to bring Bloefields Lair to a private address in Cheltenham, suspend a dining room over a swimming pool and provide sharks swimming in the water beneath the guests. With 6 weeks to plan the party we had our work cut out, but a party planner’s resources love a test and this was a good one! Counting down the days to the build for this event we liaised with the client’s private concierge and the client’s tried and trusted favourite event suppliers already secured for the event. Our help was needed to expand the party space over the pool, bring a consistent theme through all the venues for the welcome, drinks and dinner, and the live entertainment. We pulled the elements together to create a themed but sophisticated evening in celebration of everybody’s favourite spy. that we DID provide a shark swimming under the see through floor of the dining room – was it real? Or wasn’t it? That secret will be spilled over my dead body…. that our Bond girls brought the theme perfectly to life particularly as they provided the live equivalent of an opening sequence with our concept of dancing behind a bespoke paper screen at the end of the dining room – beautiful and so evocative of the opening scene of any Bond film. we tailored the marquee build over the pool to connect with a pair of tipis and a walkway to the catering marquee which was removed overnight to ensure guests had access to the hot tub the following day. Every event has its priorities and they are always different! See the full event description and photos here. Thanks Mark for everything it really was such a fantastic party… thank you for helping to organise such an amazing night – sharks, marquee over the pool, and all the James Bond theme party extras.